Introducing Hilary Rosero, Our Fabulous Treatment Coordinator! With 12 years in the dentistry field, Hilary Rosero is eager to bring her experience to the Quince Orchard Dental Specialists practice. She joined the practice in September 2018 as a Treatment Coordinator. Most of her expertise is in orthodontics, but recently she added periodontics to her resume and when we found out Hilary was looking for a new work home...we jumped at the opportunity. Hilary’s role is simply to ensure patients have a smooth treatment journey from beginning to end. She ensures patients are comfortable with the treatment plan that is presented to them, to be able to explain each procedure in detail, letting them know what to expect and to present financial options if requested for treatment. Patients seek dental treatments for various reasons and are often times not confident about their smile. Being part of a patient’s transition and seeing them leave with a beautiful smile and confidence was equally important to her as was being part of a practice that puts the needs of the patients first. She relishes the fact that here at Quince Orchard Dental Specialists we treat our patients like family. The convenience of having many dental specialists under one roof is not only rare, but it is nicely complemented by our world class customer service. The days of our patients having to coordinate their treatment plan with multiple dental offices are over! When Hilary is not busy at the practice making sure everything is running smoothly, she is often cycling, doing arts and crafts projects, baking, cooking and volunteering at her church. Hilary’s empathic and compassionate nature goes hand in hand with the golden rule by which she lives her life - treat others as you would like to be treated. It is safe to say she chose the right career to help others. Not only is she kind hearted, she is also hardworking. They say children often imitate their parents and Hilary is no different. She witnessed the hard work put in by her parents to get to where they are today and this has motivated her independence while also serving as a reminder that nothing comes easily without hard work. Dr. Ali Ghatri, her work mentor, always encouraged her to have a purpose and a plan and to see it through. 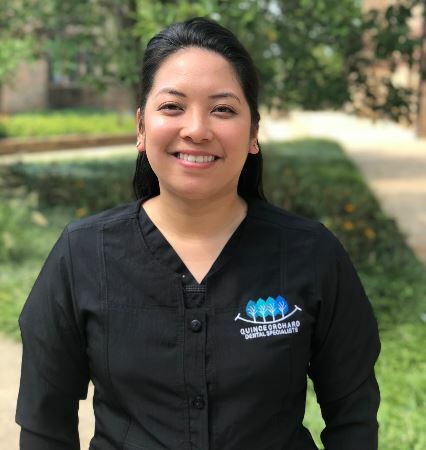 Hilary’s dedication and drive can be seen in her daily tasks at Quince Orchard Dental Specialists and we are elated to have her as a wonderful addition to our great team! If you have a question or just want to say hi to our new (but highly experienced) Treatment Coordinator, Hilary can be contacted here.